Used to identify trend direction and possible turning points. In flat markets, they can identify overbought and oversold. All market types and time frames. The upper and lower lines form an envelope drawn a number of Average True Ranges(ATRs) above and below a moving average. 20-period exponential moving averages and 2 ATRs are the commonly used parameters. Technician defaults to a 50-period exponential moving average of the close with the bands drawn at 5 ATRs (the shift) above and below the average. This is a much less sensitive calculation that will only react to major market changes. 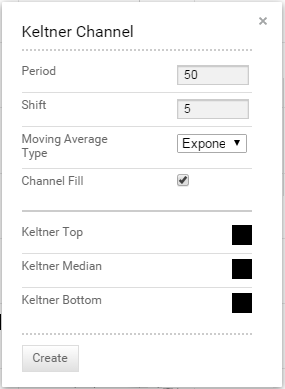 You can change all parameters, including moving average type, by selecting the proper box. You can also select colours for the top, median and bottom lines by selecting the appropriate box to bring up a colour palette. The colour for the median line determines the colour for filled bands. The theory behind channel is that its width should be determined by the data-series itself rather than by the assumptions of the speculator, as done with percent envelopes. In this way, the envelope’s distance from the mean is a function of the market’s actual intra- and inter-period price movements. Keltner Channels are very similar to Bollinger Bands but determine width based on Average True Range instead of standard deviation. This presents a smoother channel because the latter is more volatile. Many consider this a positive because it creates a more constant width. The standard formula for Keltner uses an exponential average, which is faster than a simple average, although both indicators can substitute any average type. Channels and bands are designed to contain most trading. Therefore, moves above or below the channel lines suggest a change is happening. In flat markets, touches of the bands can indicate overbought and oversold condition. If prices move above the upper band, it may be a breakout signal. In rising market, it is not uncommon to see prices spend time above the bands but in this case, it is a sign of strength. Conversely, in a down market, speaking time below the bands is a sign of weakness. One this daily chart of XJO, Keltner Channels could identify the new rising trend in August when prices touched and then stayed near the upper line. In September, when they moved above the now-rising channel, the rising trend was confirmed, and traders could ride it for many months. Later, when prices spiked higher above the channel, pulled back and then rallied to a similar high the pending change was identified. The reason was that the second high was back within the channel and that suggests waning momentum. If price moves above or below the channel, a new directional move will likely be underway.